Art for your face and body - Painted PersonalitiesPainted Personalities | What do You want to be? Who do You want to be? Are you looking for something to make your special event even more spectacular? Let us assist you in creating incredible memories! Where else can your guests become wild animals, fairy princesses, superheroes, or anything else their imagination can supply? What little boy can resist the allure of a tattoo, and not just one that is pre-made, but a temporary tattoo that is custom made for him, for his sport and with his own jersey number on it? 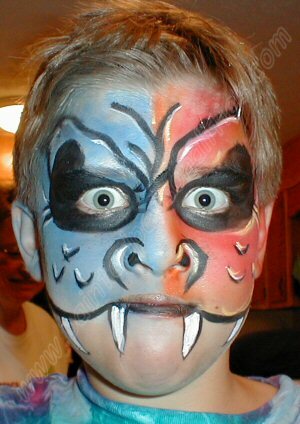 Painted Personalities offers face painting with professional products made especially for use on people’s skin. These makeup ingredients have been tested by the manufacturers and the ingredients are considered FDA compliant for cosmetic use. We also have temporary tattoo paints that we use to create custom “tattoos” for our clients. Glitter tattoos are here, too. For teens and teens at heart, we also have natural henna for your adornment. During the Halloween season, we even create special effects makeups for those who want to go all out. We serve the Birmingham-Hoover Metro area, and will travel further with proper arrangements. You can contact us at (205) 907-0747 or email us for more information on how to add more fun to your next event!